Marvel's Black Panther has been the talk of the town this weekend, posting incredible numbers with $201.7M over the three-day weekend, fifth best of all time, and a four-day President's Day holiday weekend tally of $235M, the biggest ever for that holiday and the third-biggest four-day total ever. 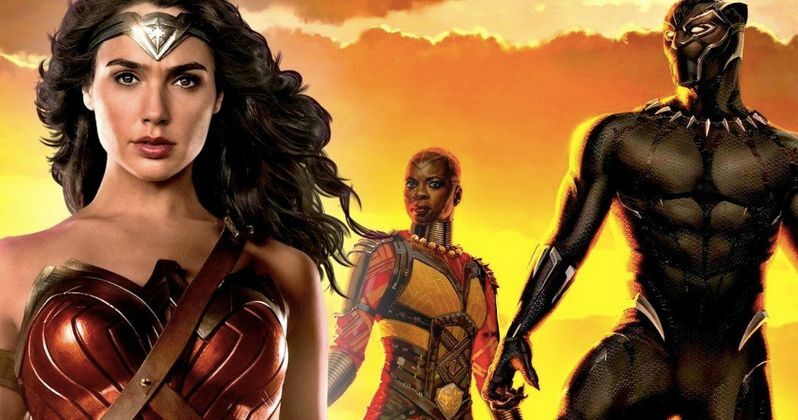 The movie's success even prompted congratulations from one of the DCEU's best filmmakers, Wonder Woman director Patty Jenkins, who expressed how happy she was about Black Panther's success in a tweet this morning. Here's what the director had to say on social media. "Huge congrats #BlackPanther on the staggering weekend. So happy for your incredibly meaningful success. Wonder Woman posse can't wait for break in schedule to see it! You're changing the world. What a wonderful thing! Congrats to you all @theblackpanther #RyanCoogler." Patty Jenkins certainly isn't the first to congratulate the movie and its filmmakers/stars on its success, with former First Lady Michelle Obama tweeting out her congratulatory remarks yesterday. Heading into its second weekend, Black Panther will go up against three new movies in wide release, Warner Bros.' Game Night, Paramount's Annihilation and Orion Pictures' Every Day, although none of these projects are expected to stop Black Panther after that monstrous opening weekend. In fact, it wouldn't be surprising to see Black Panther dominate at the box office for at least the next two weekends, with its biggest challenge likely coming from another Disney movie, the live-action adaptation of A Wrinkle In Time. Black Panther has also been a huge hit with the critics, with its Rotten Tomatoes score currently at 97%, although at one point it was at 100% when the first wave of reviews hit. Some are even wondering if it could be an early Oscar contender, despite being released so early in the year. Then again, Best Picture nominee Get Out was also released in February last year, and there was even a Best Picture winner that was released in January, The Silence of the Lambs, which, coincidentally, was the last movie to win all five of the biggest Oscars, Best Picture, Best Director, Best Screenplay, Best Actor and Best Actress. Whether or not Black Panther will get any awards season traction won't be determined for quite some time though. While Marvel has yet to confirm Black Panther 2 yet, its development seems inevitable given the massive opening weekend success. There was previously talk of multiple sequels and spin-offs being developed around several of the characters found in Wakanda, including breakout star Letitia Wright's Shuri, Lupita Nyong'o's Nakia, Danai Gurira's Okoye, Winston Duke's M'baku, Daniel Kaluuya's W'kabi and Forest Whitaker's Zuri, just to name a few. It remains unclear if director Ryan Coogler will return to the helm, or if he will also write the script alongside his Black Panther co-writer Joe Robert Cole (American Crime Story). Regardless, this sequel, when announced, will become one of the most highly-anticipated projects, which will likely happen during Marvel Phase 4. While we wait for more on Black Panther 2, take a look at the special message from Patty Jenkins Twitter.